Nancy C. Hinton, 78, of the De Soto and Olathe area passed away on September 26, 2018. A time of memorial will be held on October 2, 2018 from 6:30-8:00PM at Indian Creek Community Church, 12480 S. Blackbob Rd., Olathe, KS 66062. Nancy was born on January 6, 1940 in Norborne, MO to Mary Louise Bruemmer. She was raised in De Soto and graduated from De Soto High School. 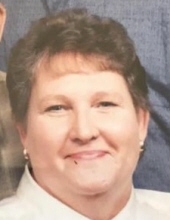 Nancy was a beautician for many years and retired from the Johnson County Sheriffs office as a clerk. She loved playing cards and enjoyed her weekly bingo outing. She took pride in being a member of the VFW Women’s Auxiliary. Nancy enjoyed her family and friends. She is preceded in death by: parents Mary Lou and Harold Long and son Kent Hinton. To plant a tree in memory of Nancy C. Hinton, please visit our Tribute Store. "Email Address" would like to share the life celebration of Nancy C. Hinton. Click on the "link" to go to share a favorite memory or leave a condolence message for the family.